This is a new series of Opinion entries which will be different from the research based articles I usually post. When my son turned 6 months like all parent we began looking into how to introduce solid foods to him. Like most people I knew about starting with fruit and vegetable purees and had already bought a couple ( OK maybe more than a couple) baby cookbooks with all these puree combinations and meal plans. We were ready to start! Then I came across Baby Lead Weaning (BLW). I had come across the (misleading) title before and ignored it because we had no plans to wean our baby any time soon. On further inspection it has nothing to do with weaning per say and everything to do with introducing solids in a very interesting way. BLW (a term attributed to Gill Rapley ) is basically about allowing your child to self feed and skipping purees altogether and going for appropriate finger food. You can read all the details and guidelines about BLW here on their official website. One of the first guidelines of BLW is waiting till your child shows signs of readiness. Is he sitting up independently? is he reaching for objects and interested in putting them in his mouth? Children at that age naturally place things in their mouths. 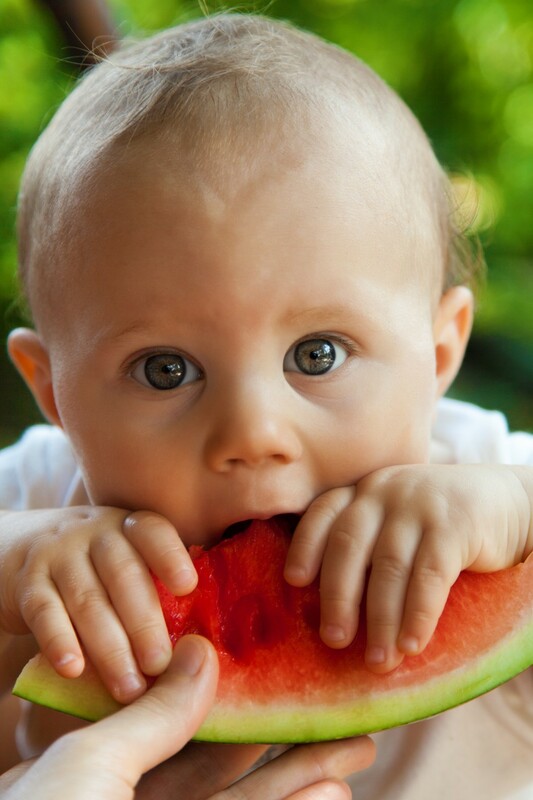 Self feeding is a natural extension to this instinct as well as exercise fine motor skills and eye-hand coordination. Feeding himself allows your child to regulate how much food he eats when he’s hungry and stop when he’s full on his own. He also gets to practice his independence by choosing what to eat and what not to eat. There is no “last spoon” to finish off, just his own self monitoring. Mealtimes can turn into real struggles as parents negotiate with their kids to finish their food, eat one more bite or threaten no dessert. Practicing BLW helps you learn to trust your child and his food intake. He may eat very little for breakfast but have a good dinner or he may have a lousy day eating but eat double his portions the next day. An article I read once on baby and toddler eating had very good advice; it said it’s always best to look at how much your child is eating within the week. That is a fairer estimate than judging day-to-day eating. 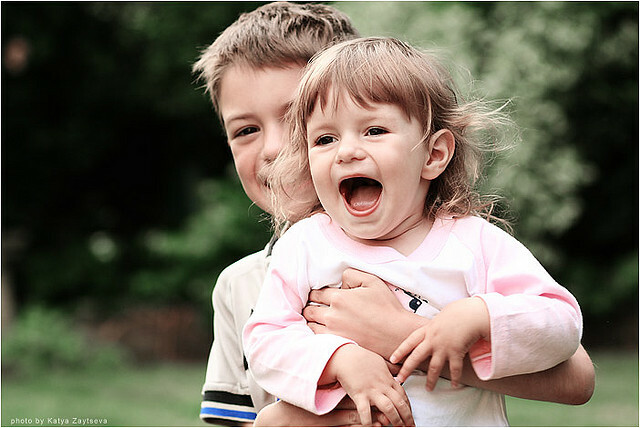 Children are people like the rest of us, they like and dislike different things, and sometimes they change their minds! By placing diverse and healthy choices in front of your child you are teaching them how to value food and decide for themselves what they want to eat. Don’t be discouraged! Reintroduce rejected foods over and over again, you’ll be pleasantly surprised when your child starts eating them! Often times I see families experience this scenario; parents eat separately then baby is fed alone either before or after parents. Sometimes it can last an hour feeding the child and it can feel like a chore! Other times parents let their children roam feed. But at a certain point and age you are going to start requesting that your child “grow up” and sit at the table and eat “properly”. So why wait to introduce this? Babies and toddlers learn instinctively through imitation. When you model eating and proper dinner behavior they’ll pick up on it and be encouraged. That’s not to say they won’t fling food or throw their spoons. These are all natural behaviors that children do as they explore the world and their limits. At the end of the week; did my child eat well? Did he have a diverse selection of healthy choices? Was mealtime a pleasant and stress-free experience for everyone? What can be changed for next time? It’s an ongoing process. Here area a list of references I’ve found useful on young children and eating. 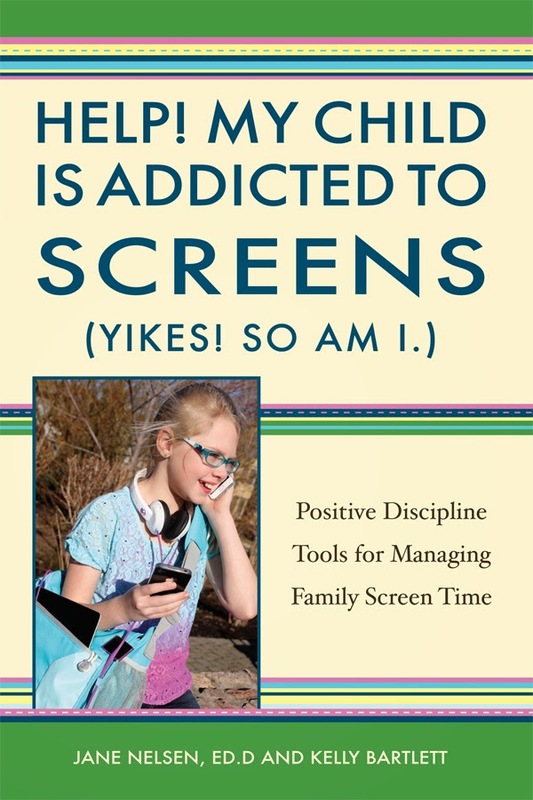 For more on screen time and how to find a balance that works for your family, check out the new ebook, “Help! My Child is Addicted to Screens (Yikes! So Am I. )” by Jane Nelsen and Kelly Bartlett. Children are now faced with increasingly more options for screened entertainment, leaving families disconnected and disengaged. Learn Positive Discipline tools that will help you and your children connect more with each other and find a balance in your family’s media use. There was once a segment on Oprah in which families where challenged to give up electronics for a week, including TV. It was interesting to watch how difficult it was for parents, as well as their children, to give up all of their screens. One scene was particularly difficult to watch. A five-year-old boy could hardly stand it to give up playing video games. His temper tantrums were quite dramatic. His mother shared that she was embarrassed when she realized he had been playing video games for five hours a day. The good news was that after the whole family went through “media withdrawal,” they discovered how to replace screen time with family activities that increased their family closeness and enjoyment. Take a look at this video from the Today Show about one family who gave up all screens for six months. Would it surprise you to know that 2-5-year-olds watch more than 32 hours of TV a week? (Nielsen) Children ages 8-18 spend more than 53 hours a week online and almost 8 hours of media use each day. (Keiser Family Foundation) In today’s digital world, families are exposed to more screen time than ever before. Smartphones, tablets, YouTube and the ever-popular game, Minecraft are just a few of the many sources of electronic connection that vie for time and attention from both parents and children. But what does this mean? Is it good? After all, aren’t children who grow up using electronic media learning skills that will keep them connected and current in in a technologically driven world? Or is too much technology a bad thing? Does it prevent kids from learning important interpersonal skills like live conversations and social graces? You don’t like to admit that it is nice to have your children so easily entertained so you can have some time to yourself. It involves such a power struggle to get the kids to disconnect from their devices. It is easier to just let it go. You don’t realize that screen time is addictive. The key lies in finding a balance. Yes, kids are keeping up with technology and learning new skills that will help them if their lives. And yes, too much media use does prevent them from becoming proficient in person-to-person communication skills. What you can do to help your kids find that balance of screen time with “real life” is to work together to set limits around daily media use…including your own. Have a family meeting. Get the whole family involved in a plan for reducing screen time. Part of the solutions should include things to do in place of screen time. It is more difficult to give something up when you don’t have plans for what else to do. Create a “parking lot” for electronics—have a basket or charging station in a central location in the house at which family members “park” their electronics during certain times of day. Establish new routines. Start with one time of day to be screen free (such as dinner) and periodically add on other times of day. Stay close with your child with special time. Children will listen to your limits about screen time when they feel understood and that you “get” them. Spend regular one-on-one time together to keep your relationship strong. Hold limits with kindness and firmness. 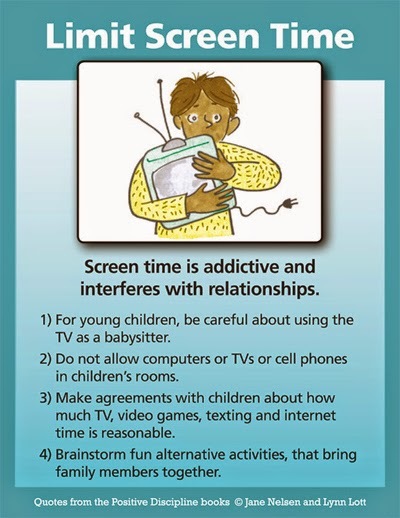 Changing a screen time habit is hard; be ready for disappointment, anger, and sad feelings. Hold your limits by empathizing with a child’s feelings and sticking with the limit you’ve set. This article is property of Positive Discipline. Early Years Parenting does not claim ownership of the above mentioned article. This month we’ll be exploring a series on playing and learning with young children. You may be wondering what play has to do with learning. Can a baby even learn? YES! Children start learning from the moment they are born. It’s not just about learning letters and number. It’s about understanding how things work and how they relate to one another. The point of learning isn’t just to know a piece of information it’s about the learning process that enables us to reach and understand that information. If you consider learning to be a process then you can realize how young children learn from every day experiences. Since play is every child’s natural behavior that’s where children learn the most! Babies are no different. All over the world babies exhibit the same behavior; they try to touch everything and try to put it in their mouths. In this stage babies are learning through their senses. They love to touch, feel and taste objects. They turn their heads when they hear a familiar or new sound. Starting around two months babies love interacting with other people. At this age play is different than older children’s play and is mainly about back and forth interaction between your baby and you! What and how is your baby learning? In the first year everything is new for your baby. This phase is all about exploration. By 9 months your baby should understand about cause and effect and that objects still exist when she can’t see them which is called object permanence. When you move a rattle back and forth for your baby she follows it with her eyes, this is called tracking. While this may seem simple enough your baby is learning in the process and it’s the first step in building your baby’s visual skills. Once you hand your baby the rattle she imitates you and shakes it herself. Observation and imitation is one of the ways children learn to use new things. Your baby starts learning about cause and effect when she shakes the rattle (cause) and the sound is produced (effect). Your baby is also developing her hand-eye coordination skills (which is a skill needed later for drawing, writing and eating) when she sees the rattle and tries to reach for it. When your baby moved the rattle from one hand to the other this helps the connections between her right and left brain as well! If you hold two rattles and alternate shaking them while pausing in between this allows your baby to shift her gaze between one object and the other which helps her attention skills. As you and your baby interact in this simple game she’s learning about conversation as you talk to her and wait for her to answer you with a coo or laugh then respond to her. She’s also setting the foundation for language as she listens to you talk. Most of all she’s learning about the object! Without realizing she’s gone through a whole learning process of observing you, imitating and understanding how this rattle works! What toys can a baby play with? You can use easy to find objects to play with your baby. 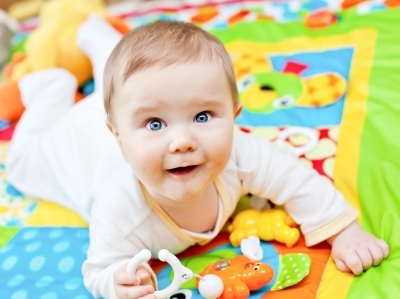 In the first three months babies enjoy toys with high color contrast. Choose a rattle that’s black and white for example. Between 3-6 months your baby is starting to reach and grab things and is more attracted to bright colors and toys that make sounds when moved. She’ll also start reaching out to grab your hair and clothes. Here are some more toys and how you can use them. Important to remember to follow your child’s lead during play so that it’s a fun experience for both of you. Once your child starts looking away, pushing or whimpering these are signs that your baby has had enough of that toy and would like something different or maybe it’s time to relax altogether. Mirrors are great for tummy-time. Find a baby-friendly mirror and place your baby on the floor in front of it. Your baby will be more eager to mover her neck upwards to look at herself and might even crawl forward! It’s a fun way for your baby to spend time on her tummy! You can also place the mirror in front of your sitting baby and let her point to herself and watch her own interaction with the toys around her. Exploring textures is wonderful for kids to learn. You can start by buying a couple of board books with textures in them that are rough, smooth and soft. You can also fill an old tissue box with different pieces of fabric and watch as your baby pulls them out one by one and explores them. You can talk about how they feel and their colors as well. Make sure the pieces are big so baby doesn’t eat them. Rolling is important for hand-eye coordination and physical development. It’s also fun! Your baby can usually start rolling a ball between 8 – 18 months. You can roll big or small balls with your baby. You can also fill an empty water bottle with colored water, shells or anything interesting for your baby to roll back and forth. Your older baby will probably crawl after it as well while your younger one will communicate with you to roll it back! Music is great for all kids. Listening to music has been associated with increased spatial reasoning. You don’t have to still to kids’ music, try music with drums and a catchy tune. You can give your baby a rattle or show him how to clap or bang on an empty box. Always make sure the toys you use are baby safe. Offer your baby only a few toys at a time and rotate a few items every few weeks to keep your baby interested. I hope this article has given you an idea on how and what your baby learns in her first year. Why is personal interaction with babies important? Studies on children in institutional care who were getting all the necessary basic care such as feeding, cleaning and sleep but were not getting any social interaction from their caregivers showed that these children were more delayed in their development than other children who were in a family context and received attentive care. Children experience delays in language, cognitive abilities and even growth. These studies showed us just how important social interaction is to a person’s development from a very young age! Developing young children’s emotional security is a process that starts at birth. Even before we think they can realize their surroundings or have an opinion, babies are already learning about what they can expect from the world from the experiences they have. Babies learn to feel either secure or insecure in the world based on the relationships they have with the people who care for them. Babies who know they have an adult they can rely on for comfort and care are more likely to be secure unlike those who experience inconsistent or unresponsive care. Why is it important to care about a child’s emotional security? Children’s social emotional state is connected to other important aspects of their lives, such as their ability to explore and learn. It also involves their ability to make friends, play and face difficult situation later in life. Children who experience a pattern of responsive and consistent care from their parents and caregivers are more likely to develop a positive sense of self, of others and the world around them. They are then more likely to have self-confidence, trust others and explore and learn new situations. On the other hand, children who experience unresponsive treatment from parents and caregivers are likely to have behavior problems, act out and have feelings of mistrust and low self-esteem. Here are some ways to help your child develop a positive feeling of emotional security. Contrary to popular belief you can’t spoil a child by being responsive. It’s how you respond that makes a difference. Your baby is sending you signals and cues all the time. Take time to observe your baby and find out what she wants. Let your child know you see her cues for help and attention. Just by giving her attention that you know she needs something is a great first step. Next it’s important to respond appropriately to what she needs. Is she pointing to a toy to play with you? Is she hungry? Does she need to sleep? Does she need a hug? Remember that no good comes from leaving a baby or young child “cry it out”. All young children have difficulty controlling their emotions your baby needs your help to calm down. Not responding to a cry sends a signal to your baby that she can’t count on the adults and caregivers around her. On the other hand when children feel understood and responded to they learn to develop trusting relationships and good self-esteem. Almost everything young children experience is new for them. That’s important to keep in mind when your little one is struggling to put on his jacket or spills while pouring his juice. These and many more are skills your little one needs to learn and learning never happens without mistakes. What’s important is that these mistakes are met with encouragement, positivity and a solution. Not criticism and punishment. Try to find a balance between giving your child independence and support. Your child needs to know you will be there when she needs help. Give him the space needed to explore new activities and places while letting him know you are there to support if things get too tough. Try not to be over intrusive with your child’s initiatives. Avoid taking over your child’s activity and being over involved. This will just push your child away from exploring new things. Letting your child do things on his own and learn through trial an error can help him feel more independent, self-reliant and confident in approaching new or tough situations. Communication is extremely important even with young children who can’t form full sentences of their own yet. While your child might not be able to fully express himself verbally, he can understand you very well. Let your child know what to expect to increase his feeling of security by communicating with your child and explaining things. Tell him why you will leave him at daycare? Mommy has to go to work. Where will you go? Mommy will go to work. When will you return? I’ll pick you up after snack time. Make sure to put your words in terms your child can understand and to stick to what you say! With repetition your child will develop a sense of trust and confidence. Remember that your child is experiencing things for the first time and has not yet mastered basic skills. How you respond is important to how your child views himself and his abilities. Mastering a skill can only come by practice. Give your child opportunities to do things on his own and be positive when correcting your child’s misbehavior or when offering your child help. This helps give your child a sense of confidence, positive self-esteem and encourages him to try again. The same applies when resolving conflict. Give your child a chance to explain, propose a solution and try it out. If it doesn’t work out then discuss why he thinks things went wrong and what he could do instead. It can be quite surprising the smart answers 3 and 4-year-old come up with once given a chance. These are just a few ideas to help your child feel confident and emotionally secure. I hope they help you out in making your parenting experience as happy as can be. This fun activity from The Imagination Tree is great for your baby’s fine motor skills, eye-hand coordination and sensory skills.Check out more Baby Play ideas on their site. Also featured on The Imagination Tree. Playing with mirrors is great for exploring the self, textures and environment. Different mirror materials can be used, like toy mirrors, story box mirrors and other safe reflective surfaces. Your baby can usually start rolling a ball between 8 – 18 months. Most children are capable of this when they are around a year old. It’s a great activity for developing eye-hand coordination, which is a skill needed later for drawing, writing and eating. Ball rolling is also great for physical gross and fine motor development. 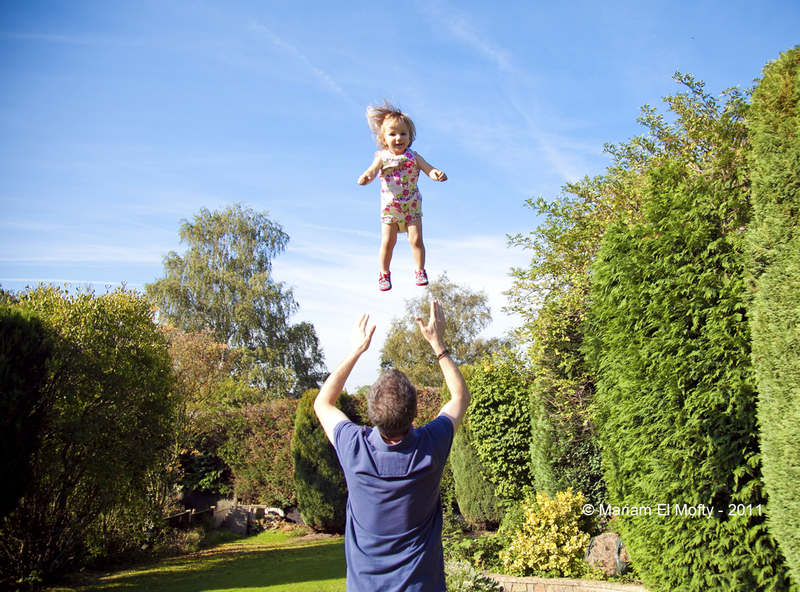 You can use small or big balls to keep your baby entertained and depending on her ability and age. Remember don’t force your baby into the activity, just giving her the opportunity is enough, she’ll participate when she’s ready. Listening to music has been associated with increased spatial reasoning. Music and dance can have numerous positive effects on your baby; putting her in a good mood, helping her relax and just plain having fun. Dancing is an activity that can foster physical development as well as emotional and cognitive abilities. I’ve had experience with babies as young as 6 months moving their feet to the beat! Don’t be shy to give your baby some shakers or instruments to help her express herself and how she feels with the music. Babies usually love water! Although they might find it stressful to take a bath in the first few weeks, most babies grow to love it and start crying when you take them out of the bath! Let your baby have some extra bath time and surround him with some rubber duckies and other safe play material. Some areas also offer swimming time for parents and their infants in groups. If you have access to a garden or beach, give your little one the chance to experience the wet mud and sand. It might be a hassle to clean up but you’re giving him a great experience in feeling textures and exploration which is great for his brain development. Remember never leave a baby in water unsupervised as it is extremely dangerous since babies can easily drown in a few inches of water.